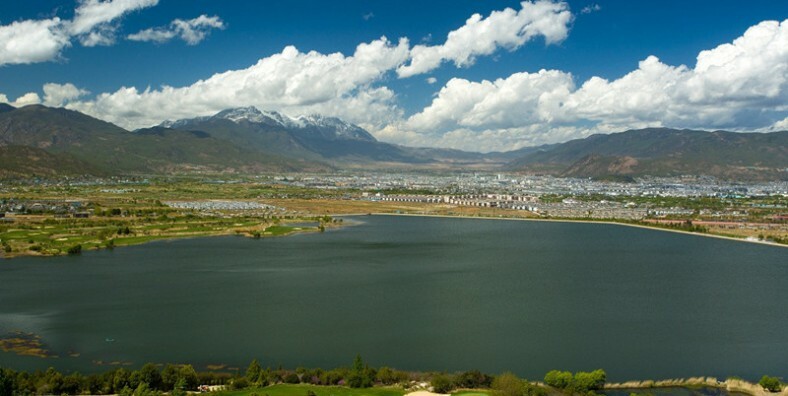 Yunnan Province holds some of the most exciting habitats and alluring species in the whole of Asia, about half of China’s birds and mammals.This 25 days West Yunnan Birding Tour is a Panorama Birding Tour with these birding places including Kunming, Shangrila, Tacheng, Lijiang, Jianchuan, Dali, Baoshan, Baihualing, Tengchong, Yingjiang, Ruili. Enjoy a winter birding tour in Yunnan province. A Panorama Birding Tour with the most popular birding places. Do morning birding at Haigeng Park, Dianchi Lake and The Green Lake. Take the morning flight to Shangrila. A whole day birding around Napahai Lake. Later stroll around Dukezong Ancient Town and walk up to the top of Guishan Hill to see the Grand Prayer Wheel and have a panoramic view of Shangri-La city and Dukezong Ancient Town. In the morning, visit Songzanlin Monastery and do the morning birding around Songzanlin Monastery and Lamu Yangtso Lake. Located in the northern part of Shangri-la County, the monastery is the largest Tibetan Buddhist monastery in Yunnan province and is sometimes referred to as the Little Potala Palace. After lunch, drive about 140 km to Tacheng Town and pay a visit to the villages around. Situated in Weixi County of Diqing Prefecture, Tacheng is the hometown of the snub-nosed monkey. Arrive at Tacheng Snub-nosed Monkey National Park and feed the monkeys in the late afternoon. In the morning, birding in the park and feeding the monkeys as well. Then drive along the Yangtze River and arrive at Shigu Town. Visit the First Bend of Yangtze River, the Stone Drum, the Iron Chain Bridge and Red Army Memorial Hall. Continue the drive to Lijiang and check in hotel. In the morning, enjoy the birding at Lion Hill, Black Dragon Pool and Xiangshan Mountain. Then visit Lijiang Ancient Town, Mu Palce and Shuhe Old Town in the afternoon. Transfer to Lashihai Lake and visit the birds around the lake. Lashihai Lake turns into a paradise for migratory birds during winter times. Around 140,000 migratory birds spent their winter beside Lashihai Lake. A repertoire of 165 species of birds can be observed in Lashihai. Drive one hour to Jianhu Lake in Jianchuan County and do the birding around Jianhu Lake. After lunch, visit Shaxi Ancient Town including Xinjiao Temple, Yujin Bridge, Sideng Street and the Anient Stage. Transfer to Dali in the afternoon. In the morning, birdwatching in Mt. Cangshan. Have a good opportunity to see Lady Amhersts, fire-tailed sunbirds and blood pheasant at 3100m elevation. Do bird watching in the farmland in the afternoon. After morning birding in Cangshan Mountain, drive to Bawan in Baoshan city (280km). Baoshan is the main stepping off point for birders visiting Gaoligongshan. Evening bird watching for tropic birds along the Nujiang River in the valley and farmland. After morning birdwatching, drive to Baihualing in Gaoligongshan. Do birding along the road. Baihualing is the most easily accessible part of Gaolingong Mountains. Birds at Baihualing include Sclater’s Monal (high elevations only), Silver and Mrs. Hume’s Pheasants, Stripe-breasted Woodpecker, Ward’s Trogon (rare), Brown Wood Owl, Hodgson’s Frogmouth, White-bellied Green Pigeon, Long-tailed Broadbill, White-winged Magpie (rare), three species of shortwing including Gould’s, Chestnut-vented Nuthatch, Spotted, Grey-sided, Blue-winged, Scaly and Red-tailed Laughingthrushes, Coral and Slender-billed Scimitar Babblers, Grey-bellied Wren Babbler, Black-headed Shrike Babbler, Yellow-throated Fulvetta and Beautiful Sibia. Arguably Baihualing’s greatest avian attraction however is Cachar Wedge-billed Wren, a species that’s not uncommon here. Dark-rumped Swift has even been reported here. Do birding tour around Birding Point of Lady Amherst’s pheasant Bird 001(白腹锦鸡001 in Chinese). The whole day birding at Birding Point of Scarlet finch. The whole day birding at Birding Place 32. The whole day birding at Birding Place of Mrs. Hume’s pheasant. After breakfast, drive towards Tengchong. On the way, make several stops for some easy roadside birding. Spend about 2 hours birding in a forest park on the way. Then drive to Tengchong city and spend the rest of the day birding at Laifengshan Forest Park. In the early morning, birding at Laifengshan again. After breakfast, drive about 50 km to Yunfengshan, a Taoist Mountain and important habitats for some mid-altitude birds. Climb to a Taosit Monastery on the top of the mountain. In the late afternoon, drive to Yingjiang. Drive about 70 km to Yingjiang Hornbill Valley for birdwatching. Stay overnight at Hongbeng Village, about 20-minute drive from Yingjiang Hornbill Valley. Birding at Birding Place 2 near Yingjiang Hornbill Valley. Drive back to Yingjiang in the late afternoon. In the early morning, drive to Tongbiguan which boasts the best rain forest in China. There is a huge tree called The King of Banya Trees, with lots of birds to perch. Bird species you may see in Yingjiang: Grey Peacock Pheasant, Indian Spot-billed Duck, Jerdon’s Baza, Rufous-bellied Eagle, Oriental Hobby, River, Red-wattled, and Grey-headed Lapwing, Green Bee-eater, Blue-throated and Blue-eared Barbet, White-browed Piculet, Greater and lesser Yellownape, Long-tailed and Silver-breasted Broadbill, Blyth’s and Black-eared Shrike Babbler, Grey-eyed Bulbul, Grey-bellied Tesia, Golden Babbler, White-hooded Babbler, Greater and Lesser Rufous-headed Parrotbill, Chinese Blue Flycatcher, Sapphire Flycatcher, Slaty-blue Flycatcher, Golden-fronted and Blue-winged Leafbird, Ibisbill, Red-billed and Coral-billed Scimitar Babbler, Streaked Wren Babbler, Spot-winged Starling, Collared Myna, Spot-winged Grosbeak, Black-backed Forktail, etc. In the early morning, drive to Xima and look for birds which is a village bordering Myanmar. Walk along an ancient mud road which local people call it Mahuangpo or Road of Leeches due to that there are lots of leech in this area. In the early morning, drive to Tongbiguan to have some birding in the forest and the farmlands nearby. Then proceed to Ruili. Look for birds in Hushadongshan. Upon Ruili arrival, drive to Jiule Reservoir to look for Rufous-necked Laughingtrhush, Little Cormorant, Black-crested Bulbul by the side of the reservoir if time allows. Birding in Nanjingli and Ruili Botanical Garden. Birding in Moli Tropical Forest and Wanding Forest Park.